Today is the feast of the Transfiguration of Our Lord. I remember learning about ellipses. They are a geometric shape composed of two foci. Today’s feast is one reality with two foci. They are the revelation of the true character of both divinity and humanity. The glory of God and the glory of man are unveiled as perfectly fulfilled in Christ Jesus. The glory of God does not require man. However, the glory of man does not exist apart from the glory of God. In essence, therefore, the paradox of this feast is that the revelation of the glory of man is the revelation of the glory of God in man by grace. I have chosen two reflections for your possible use. 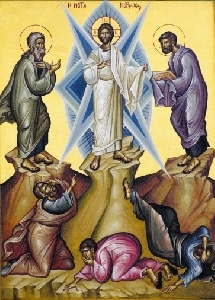 The first, by St. Anastasius of Sinai, deals directly with the transfiguration as a foretaste of the consummate glory of God in man – Christ Jesus. The second, by St. John-Marie Vianney, deals with the thorny question (pardon the pun) of why this life continues to be such a “veil of tears” in view of the resurrection of Christ Jesus. In other words, if Christ Jesus has be raised victorious then why does evil still seem to reign undeterred?! St. Irenaeus bishop of Lyon said, “The glory of God is man fully alive.” Man fully alive is man filled with the glory of God. Man fully alive is man not just filled but fully manifesting the glory of God in every thought of his mind and heart, every deed of his life in this world, and every cell of his body. That requires our transformation. One aspect of that transformation requires contending with evil by the grace of God. Such contention, as St. Paul says, “…completes what is lacking in Christ’s afflictions” (Colossians 1.24). Why, my dear brethren, are our lives full of so many miseries? If we consider the life of man carefully, it is nothing other than a succession of evils. The illnesses, the disappointments, the persecutions, and indeed the losses of goods fall unceasingly upon us so that whatever side the worldly man turns to or examines, he finds only crosses and afflictions…. Indeed, my dear brethren, man on earth, unless he turns to the side of God, cannot be other than unhappy. Do you know why, my friends?…Well, here is the real reason. It is that God, having put us into this world as into a place of exile and of banishment, wishes to force us, by so many evils, not to attach our hearts to it but to aspire to greater, purer, and more lasting joys than those we can find in this life. To make us appreciate more keenly the necessity to turn our eyes to eternal blessings, God has filled our hearts with desires so vast and so magnificent that nothing in creation is capable of satisfying them. Thus it is that in the hope of finding some pleasure, we attach ourselves to created objects and that we have no sooner possessed and sampled that which we have so ardently desired than we turn to something else, hoping to find what we wanted. We are, then, through our own experience, constrained to admit that it is but useless for us to want to derive our happiness here below from transient things. If we hope to have any consolation in this world, it will only be by despising the things which are passing and which have no lasting value and in striving towards the noble and happy end for which God has created us. Do you want to be happy, my friends? Fix your eyes on Heaven; it is there that your hearts will find that which will satisfy them completely. All the evils which you experience are the real means of leading you there. […] Jesus Christ, by His sufferings and His death, has made all our actions meritorious, so that for the good Christian there is no motion of our hearts or of our bodies which will not be rewarded if we perform them for Him. Glory to God for His Glory living in you and me. Let us embrace this transformation even though specific aspects of it remain mysterious to us. Pastor Rob Des Cotes, has written a wonderful reflection this week, Trusting God With Our Inadequacies. It provides a good continuation of my thoughts in my last post “The Nitty Gritty of the Gospel.” I commend it to you. Once again, we need to completely depend on God for all we need in every area of our life to live and minister in this world as ambassadors of Christ and His Kingdom. Our life’strength/wisdom etc., is His strength in us and through us.